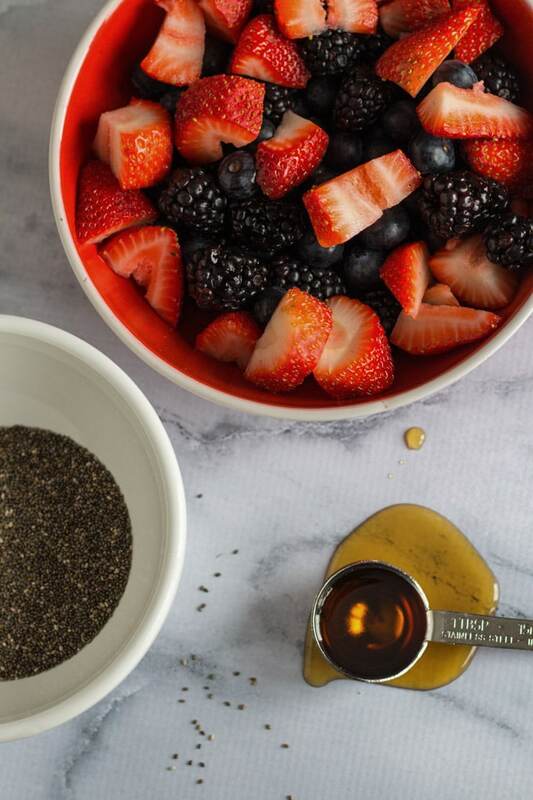 Hello breakfast and hello Triple Berry Chia Jam! As I mention on my About page, I spend most of my time clean eating (or at least aspiring to! ), so I thought I would share one of my favorite clean eating recipes. It’s quick and simple, and I always have a batch in my fridge…….Triple Berry Chia Jam! I love jam. My go-to breakfast for years has been peanut butter and jam on a toasted whole wheat English muffin (or a multi-grain One Bun from Costco). I almost always used store-bought jam and never really paid attention to the amount of sugar I was adding to my breakfast. Then I came across a number of chia jam recipes on different food blogs and thought I would try a version of my own. And voila, you have the recipe I am sharing today! I usually make Triple Berry Chia Jam every two weeks! A lot of times, I use whatever fruit I have on hand – fresh or frozen, most berries work in this jam. I typically use blackberries, blueberries and strawberries. I love the rich color the blackberries and blueberries add to the jam. Sometimes I will substitute raspberries for one of the berries…..just to change it up a bit. 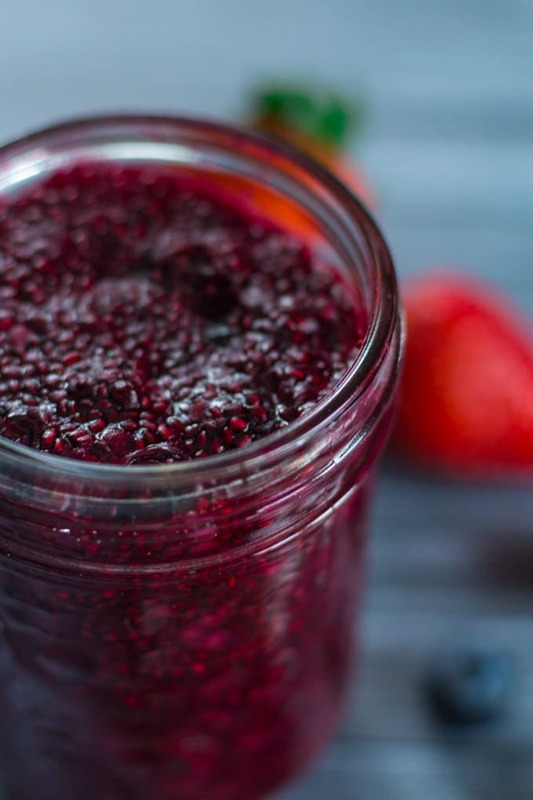 The fruit really provides all the sweetness you need in this jam, but a little drizzle of maple syrup adds a bit more sweetness and provides additional liquid to absorb the chia seeds. The amount of maple syrup can be adjusted depending on your desired level of sweetness but I wouldn’t go overboard as it could make your jam too sweet and runny. The chia seeds are the magic in this jam. They help thicken the berry mixture and give it a jam-like seedy texture. And a bonus – they are high in fibre, which is great for digestion, and they are high in calcium and iron. Overall, the chia seeds help make the jam a filling addition to your breakfast or snack. Aside from toast, you could use it as a fruit topping on yogurt, granola or pancakes, or even use it as filling in cookies, which I do quite often! (Check out this recipe for Peanut Butter and Chia Jam Cookie Cups). There are many chia jam recipes out there so I’m not claiming this is a unique recipe. While I’ve adapted it to my tastes, it has been inspired by a number of different recipes. 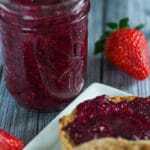 Triple Berry Chia Jam is quick and easy to make, high in fibre, and a great addition to breakfast or mid-day snacks and desserts. Add the fresh or frozen berries to a sauce pan with the maple syrup and cook over low heat until the fruit becomes liquid-y. This will take about 10 minutes, or a little longer if using frozen fruit. Remove the fruit from heat and mash with a fork or potato masher. Don’t worry if the blueberries do not fully mash. Add the chia seeds and stir until well combined. Cover the jam and let sit for 20 minutes. This will allow the chia seeds to plump and thicken. Jam should be refrigerated and enjoyed within 2 weeks. The amount of maple syrup can be adjusted in the recipe for desired sweetness. It could also be omitted altogether. Likewise, the amount of chia seeds can be adjusted depending on the desired level of thickness. I enjoy thick jam, so this recipe will be thick. 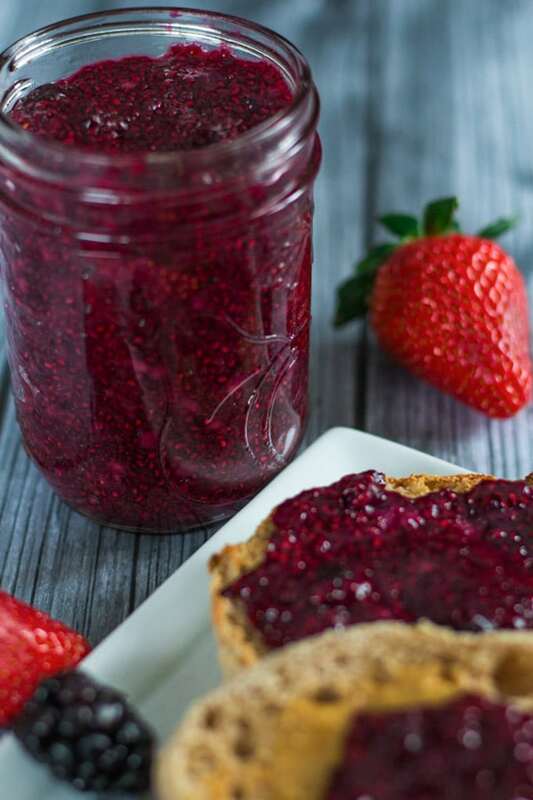 For jam that is a little runnier, use less chia seeds. Once the jam has set, if it needs to be thickened, additional chia seeds can be added. Hey Leanne! This looks scrumptious and I plan on making it really soon, I’m just waiting for some seasonal berries. I was wondering, though. Have you ever tried freezing it? Thanks Lisa! I make this jam all the time using a mix of frozen berries, but fresh berries is definitely my favourite way to go. I’ve never tried freezing a batch of the jam, although I have frozen oat squares with jam in the middle, and it seemed to preserve well. If you freeze the jam, please let me know how it works out! Have a great weekend!